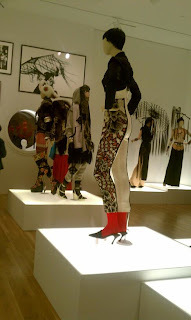 I have to gush and tell you how INCREDIBLE the Jean Paul Gaultier exhibit at the Dallas Museum of Art truly is! Morgan and I attended the lecture by Dr. Caroline Weber titled Jean Paul Gaultier: Iconoclasm and Influence and got to see a sneak peak of the exhibit before it opens up to the public this Sunday, November 13, 2011. I don't know what I was expecting, but it sure was not the show that is on display at the DMA. As a member of the Dallas Museum of Art, I couldn't be prouder of the fantastic workmanship and sheer creativity that went into creating an exhibit as comprehensive as this one. To say that this is a coup for the city of Dallas and the Dallas Museum of Art is an overwhelming understatement. 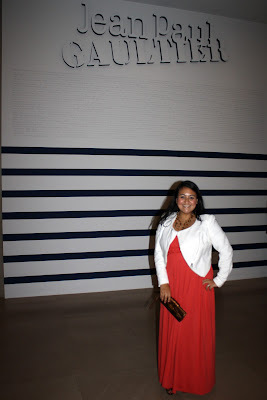 Last night, we saw tourists from other countries who were visiting Dallas specifically to attend the Gaultier exhibit. As we wandered around the SIX rooms of the amazing display, I heard tours being led in both French and Japanese and I was so humbled that a fashion event of this magnitude is being held in the city that I love so much and am honored to call my home. 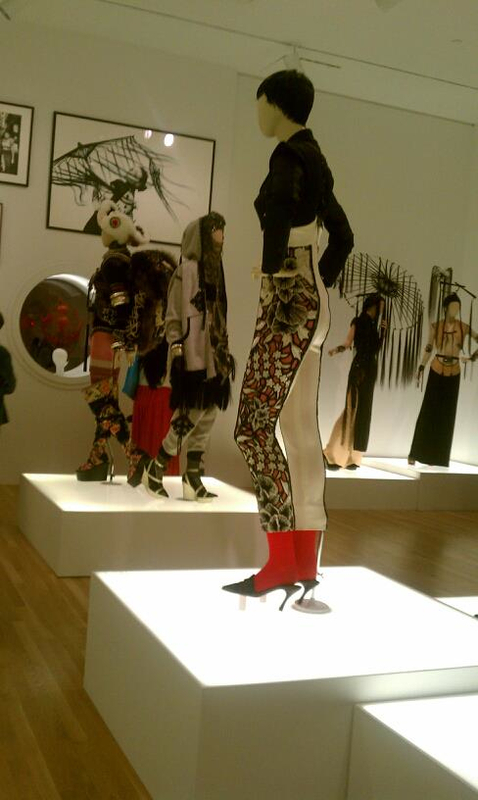 To start when you enter the exhibit, you are greeted by speaking mannequins! Including one of Gaultier where he is welcoming you to the DMA and the exhibit. This was done by projecting the faces onto blank mannequin canvases. As a result, they blink, look away and wink at you from time to time. This photo is one of these mannequins (she blinked in my photo! 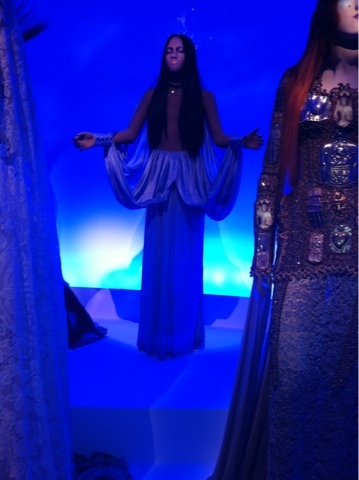 sigh) and she is wearing the first dress designed by Gaultier in 1971. In this area, are some of his most known and celebrity worn designs including the Virgins collection as well as his most iconic design, the sailor theme (nautical stripes and sailor pants) which is one of my favorites as well. The exhibit is comprised of six different themed rooms from the Boudoir which houses his infamous corsets, including the two worn by Madonna during her Blond Ambition Tour; a Red-Light district that made me feel just the right amount of dirty for peeking into other people’s private play; a Punk Parisian street catwalk and the opportunity to sit in the front row at a Gaultier runway show; a media extravaganza and finally a straightforward exhibit of amazing wedding dresses and head gear made of human hair and birdcage! It was a great evening; one that I had no expectations for and yet managed to blow me away. The lecture by Dr. Caroline Weber compared Marie Antoinette and Jean Paul Gaultier and it was a very insightful look into the life of a queen that I had honestly never had much of an interest in. She (Dr. Weber) is a professor of french and cultural history for Barnard College at Columbia University. 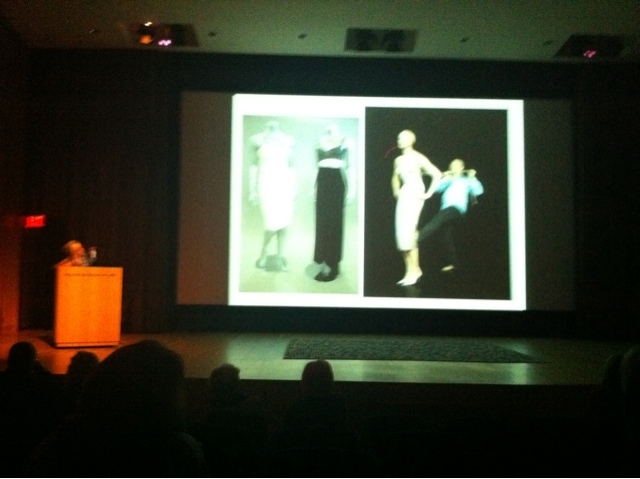 Dr. Weber piqued my curiosity and showed me once again that fashion is never actually new, simply reinvented. This blurry image was taken during the lecture without a flash, but I wanted to capture one of my favorite images. This one of Gaultier pushing a model into his corset and using even his foot to gain some leverage just as in the days of Marie Antoinette! Finally, as we were leaving the exhibit, we ran into the amazing Jan Strimple in the elevator as she was sharing a Marie Antoinette story. We almost missed our stop because we didn’t want to get off the elevator without hearing the end! 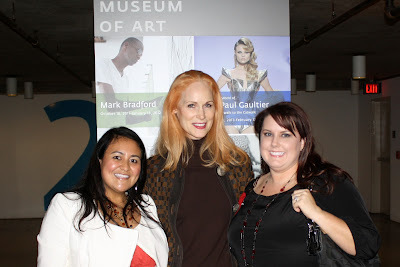 She was so gracious and for those who have never met her, Jan is definitely an icon in the Dallas Fashion scene. It was a wonderful evening and I am so humbled that I was able to experience it with such fabulous company!